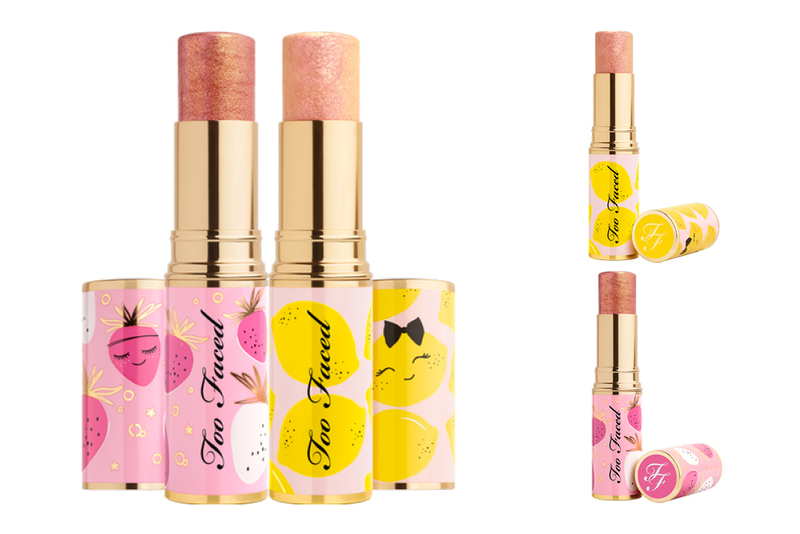 New Release: Too Faced Tutti Frutti launches at Mecca – Oh My Stellar! Being Australia, we often get releases later than other countries so I don’t always write about them (nor do I get the chance to try them on time for the post to actually be relevant). 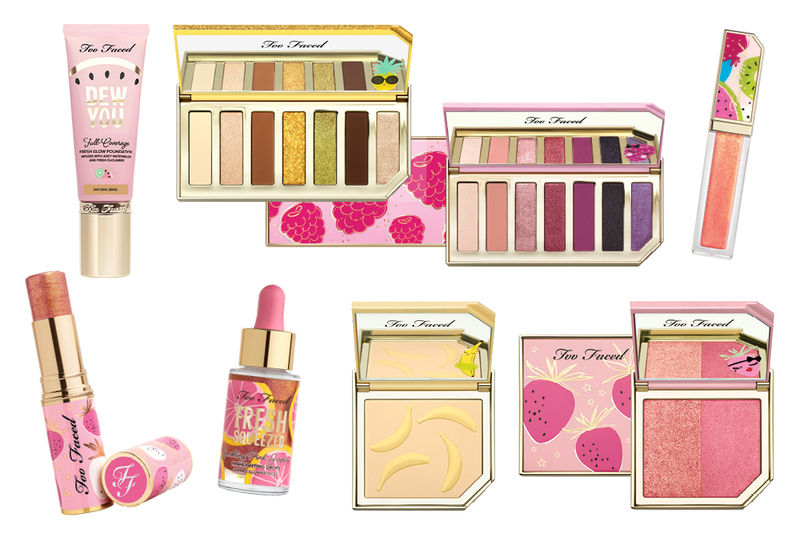 When Too Faced first announced the Tutti Frutti collection, I was super excited because the concept and packaging of it was just so cute – and not overdone like some other releases. However, I first thought that this was never going to come to our shores, since it was an Ulta exclusive, but it’s finally here at Mecca Maxima! 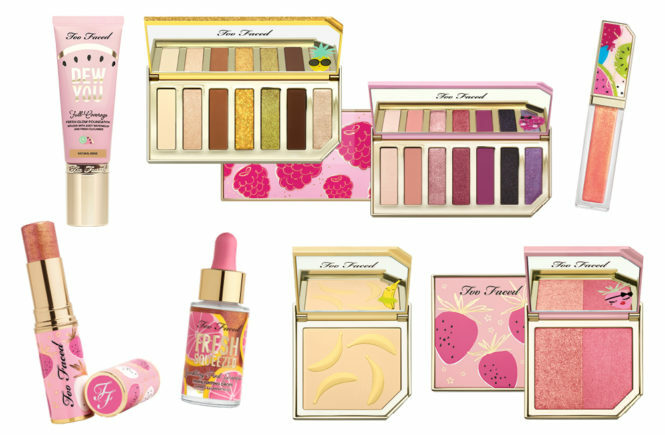 Introducing a new fabulous and fruity line from Too Faced, just in time for Summer! It’s impossible not to be the life of the party with these feminine pops of colour, infused with juicy scents and party-ready sparkle. Wrapped in playful prints and modern packaging, the collection includes 53 brand new products such as candy glaze lip glosses, sparkling eye shadows and refreshing cucumber and watermelon-infused foundations that turn any moment into a celebration. 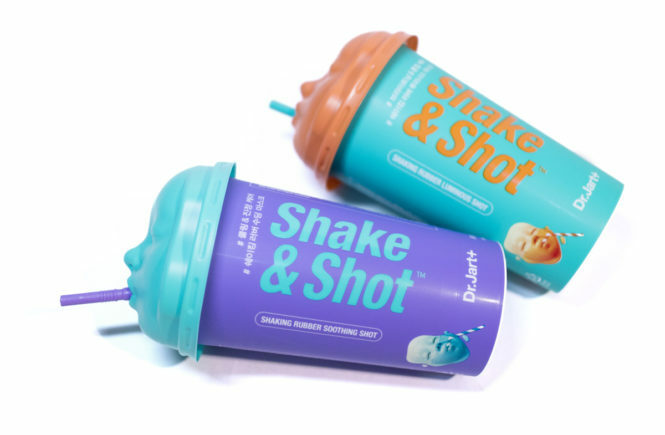 So, let’s get right into this because I want to share details on every product in this new release and my personal thoughts on whether I’ll be buying them! I’m an eyeshadow fiend so I’m always the most excited for an eyeshadow palette. The two from this collection are smaller than Too Faced’s usual offerings because compact seven pan palettes that can also be used for travel purposes. Both of these palettes contain matte, metallic and satin shadows, claiming to also have intense one-swipe coverage (and therefore intense pigmentation). I’ll definitely be checking these out in person as soon as they’re in store because I’m really keen on them. At first, I wanted the Sparkling Pineapple palette but now I’m feeling like the Razzle Dazzle Berry is more my style (since the first is a bit more neutral). I would test these but I don’t think I will be purchasing them because I don’t use liquid eyeshadows in my make up routine often; and i’m trying very hard not to buy things I won’t get a lot of use out of. That being said, some of the shades (like Honey, Please!, Guava Glitz and Strawberries & Champagne) look really pretty but I’m not sure about how these will last on my eyes. Most liquid eyeshadows crease and fade immediately. 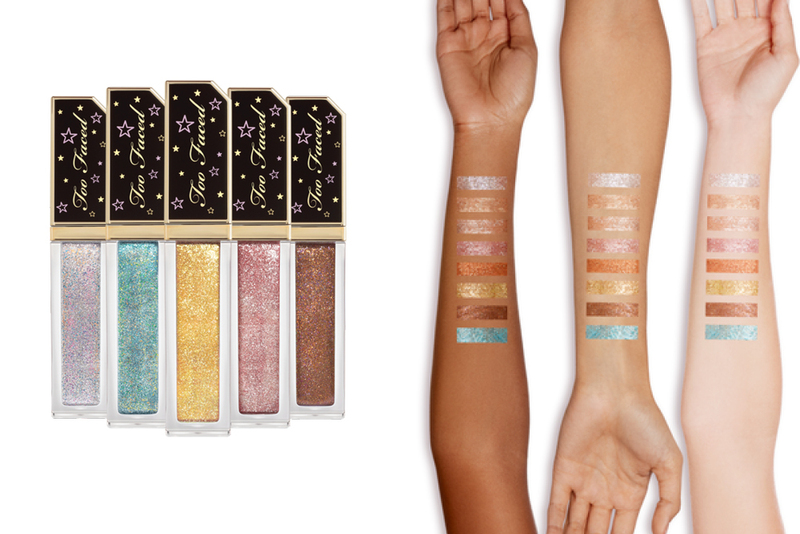 These will need to be comparable to the Stila Magnificent Metals to convert me, since the price points are similar enough (Too Faced is just a little bit cheaper). 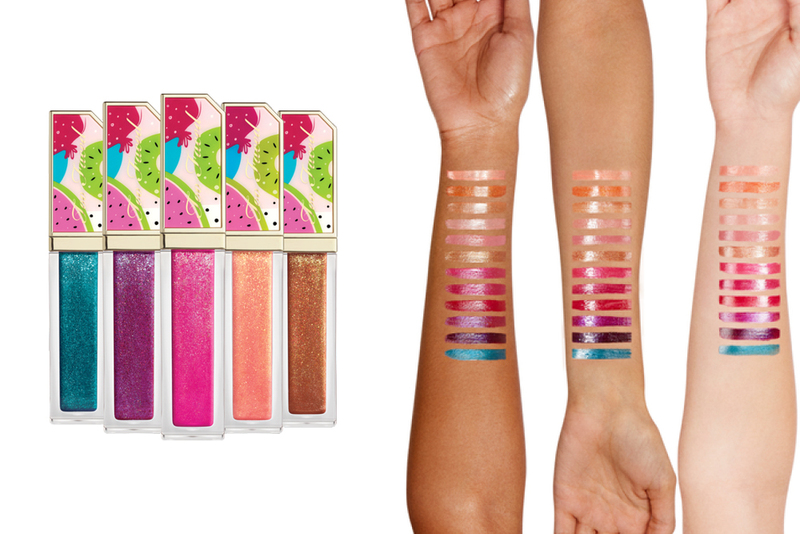 And, of course, a fruit inspired collection would be nothing without a good lip gloss – juicy, bright and summery. They are described as, “A candy-finish lip gloss that delivers high-impact, fruity colour and is bursting with a juicy Tutti Frutti scent.” In this collection, there are twelve different shades of this gloss ranging from more neutral pinks to a super out-there blue (which I will not be able to understand until I swatch it in person). Out of these, I think that I’m most interested in the more neutral shades, or the red and orange, as I don’t tend to be too adventurous with glosses. 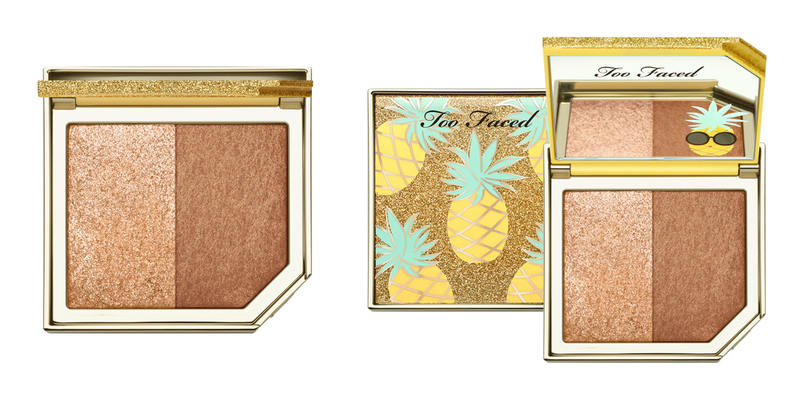 They do look like they have a bit of a shimmer to them which I usually don’t like; however, I have used a glittery gloss from Too Faced before and found that their formula is very smooth and non-gritty. I’ll most likely go to swatch and try these out in store to see what colour works best for me, because I am pretty keen! If you’re a fan of glowy, shimmering blushes then this is definitely going to be the product for you! This is a duo that can be used as a blush or as a ‘glow’ (which I assume means highlight though I feel like most of these shades will be too dark as a highlighter), but can also be mixed together for a “multi-dimensional flush of colour” – which I personally think will be the best way to use them. I personally love glowy blushes because I think they give a very natural and radiant flush to the cheeks, without needing to use too much product. It’s great for people who like a more natural or no-make up look. Out of the four, I feel like Apricot in the Act and StrobeBerry would work best for my skin tone, as the other two seems like they would be better suited for medium to dark skin tones. 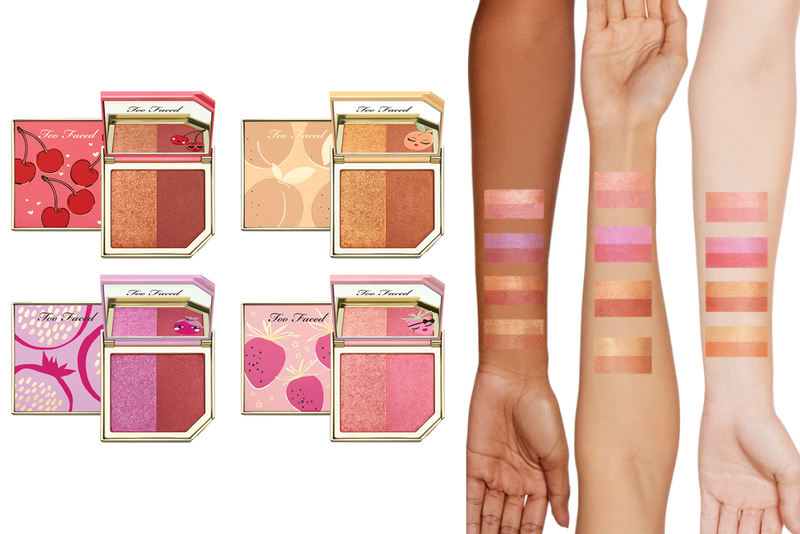 I’ve always had a great experience with Too Faced blushes so I think that I’ll check these out in store too. As long as they’re different to what I already own, then I can justify buying another blush (even when I own around a thousand). A similar product is this strobing bronzer which, like the blushers, have that same duo pan, which allows you to mix the two or layer each side accordingly. Through this, it claims to create a “classic, lit-from-within bronze,” or allowing you to customise your glow accordingly. Also, this is pineapple scented, which is super nice. That all being said, I don’t think that I’ll be buying this. In fact, I won’t let myself buy this because I know that I don’t use bronzers (I just keep buying them because they’re pretty). If you do use bronzers though, this would be something good for giving a sunkissed warmth to the cheekbones but would likely be too glowy to use all over. 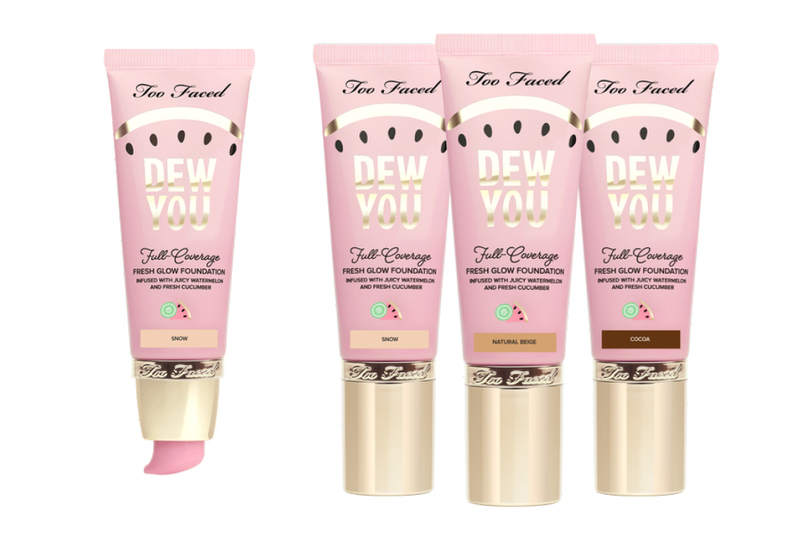 Next, Too Faced also brought out two different highlighter sticks which are multi-use and have a cream-to-powder formula with an opalescent finish. They claim to have a weightless formula that blends without disturbing any make up. It comes in two shades: Pink Lemonade (which is more gold and pink lemonade scented), and also Strawberry Sparkle (which has a more pink tone and is – of course – strawberry scented). The claims for this highlighter stick seem good, especially since they specifically state that it applies without affecting base make up. I usually don’t use stick highlighters for that reason so, even though I was very ready to skip out on this, I may check it out in store and give it a chance. At AUD$44, it is a bit expensive for something that I might not use though, so I’m on the fence about it. For those who can’t get enough glow on their skin and want to kick it up another notch, Too Faced also brought out these sparkling highlighter drops that can be used as an all over moisturiser or mixed in with your foundation. 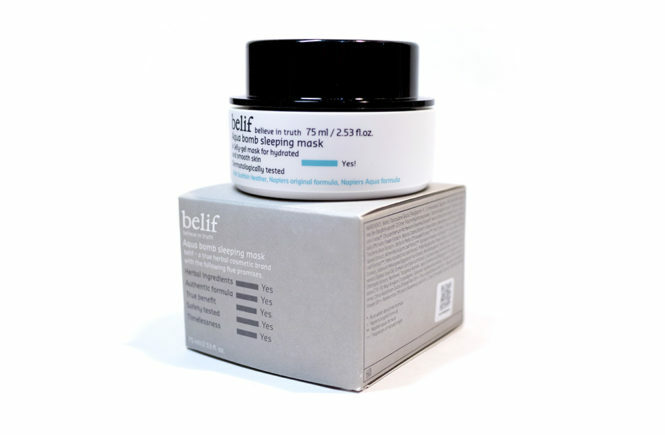 This claims to have a weightless formula too so won’t be sticky or heavy on the skin. It is available in two shades, Sparkling Pina Colada or Sparkling Pink Grapefruit. If you usually like illuminating drops, then this would be a nice one to check out (especially if it had a nice fruity scent too). Personally though, I don’t end up using products like this – I already have too many steps in my make up routine and can’t afford to add more – so I will likely not be purchasing this one. I want this. Honestly, it’s that simple. 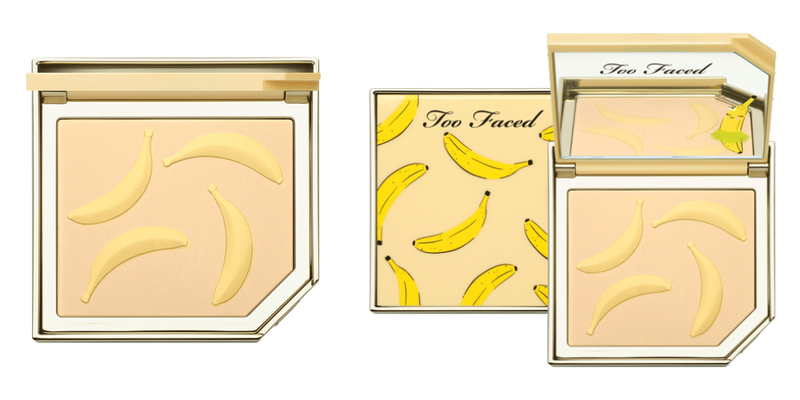 I own one other banana powder and I’m light enough to use it as an overall setting powder so it’s most likely that I will be using this one the same way (though this has more of a neutral undertone than yellow). This is described as a, “A complexion-perfecting, weightless setting powder that brightens while blurring imperfections for the most a-peeling finish possible!” The powder helps to set make up and give a bright, smooth and soft focus look. The best thing about this product is, honestly, the packaging. I love the little yellow bananas in the pan and it’s just a simple but effective take on the concept of the banana powder. I’ll go swatch this is store to see if it’s as fine as I like (and it most likely will be), but I will likely be picking this one up soon! Do I need another pressed powder? Probably not. But I want it. Yes! I am personally so glad that they’ve released this foundation because I feel like it was really missing from Too Faced’s offerings here in Australia. For those who follow my blog, I am a huge fan of their Peach Perfect Foundation (which has a light, matte finish and works well on my skin) but there had yet to be one for my girls who want a dewier finish. Lo and behold, this is the answer! 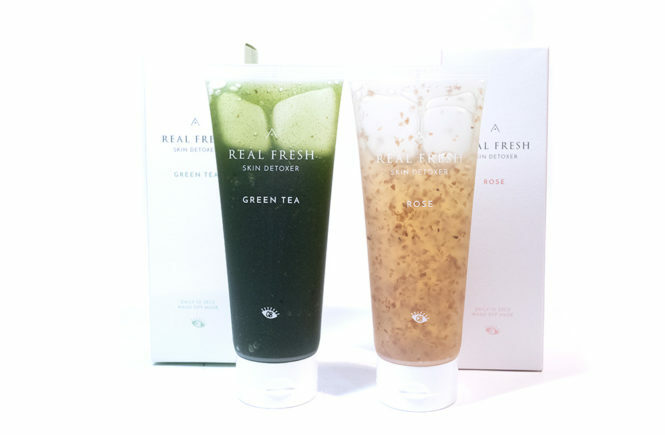 It is described as a, “A long-wearing, watermelon, cucumber, and vitamin C infused gel-cream foundation that hydrates and brightens the complexion, all while providing full-coverage for a dewy, fresh, and luminous glow.” It also claims to help soothe, moisturise and nourish skin to give a fresh complexion. This foundation is available in 20 shades (and, if it’s the same as the Peach Perfect, then I would wear the second lightest shade). 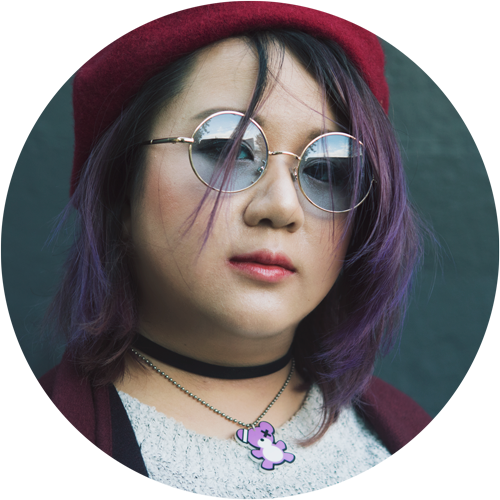 I used to love dewy foundations and I still like to wear them sometimes, but I prefer semi-matte finishes now. I would try this one out but chances are that I will personally stick with my Peach Perfect Foundation. However, I’m really happy that this option is now available so people have more choices when it comes to finishes! Dewy finishes would be great for people who want a natural look or who have a drier skin type. 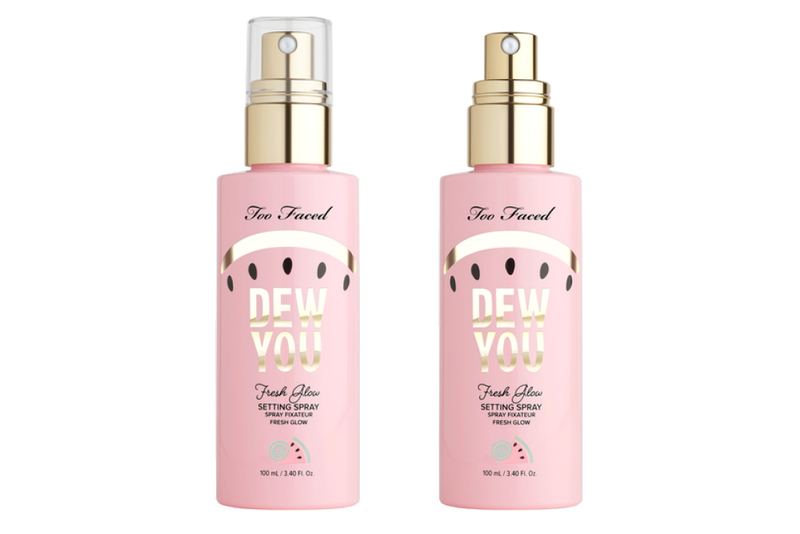 And lastly, there is the Dew You Fresh Glow Setting Spray which is intended to help lock down and set make up while also giving you a glowing, dewy finish. 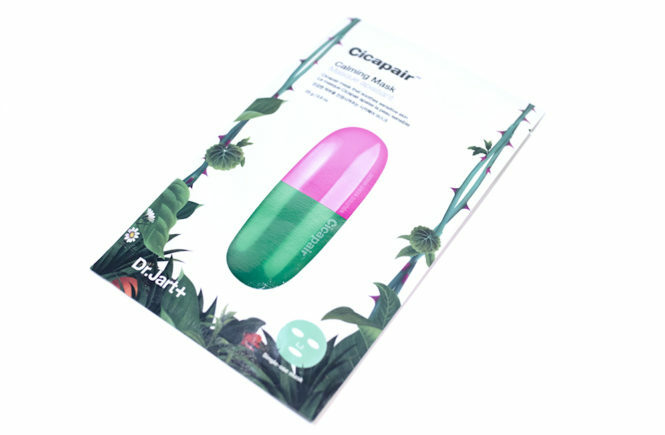 It is watermelon and cucumber-infused with a pearlescent finish. 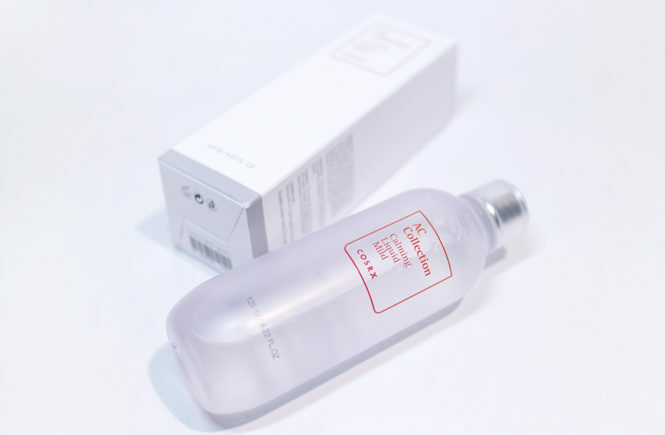 Personally, I’m not sure if I will be picking this one up as I don’t usually like dewy setting sprays. I have used the MAC Cosmetics Fix+ sprays (in the shimmers, and original, and the matte) and enjoyed them but it’s actually quite rare. I would pick this up if they had a mini to test out but, for AUD$44, I wouldn’t take the risk of this not working for my skin type. 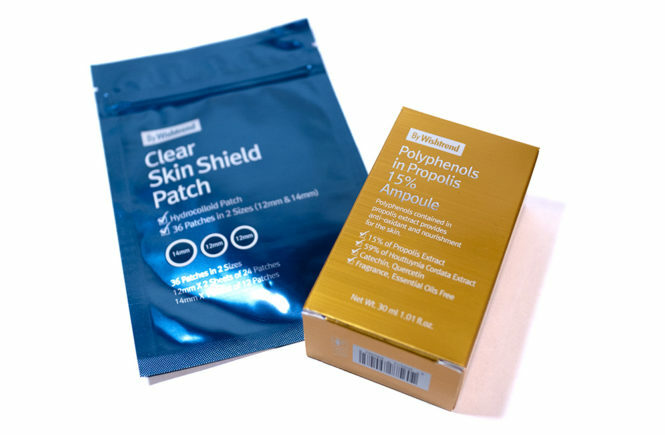 I think that those with dry skin would like this a lot more! So that’s it guys! The entire collection that’s going to be dropping at Mecca Maxima (both online and in-stores) on 30th January 2019 – so ridiculously soon! I already have my eye on a couple of these and I can’t wait to go in store to check them out too. 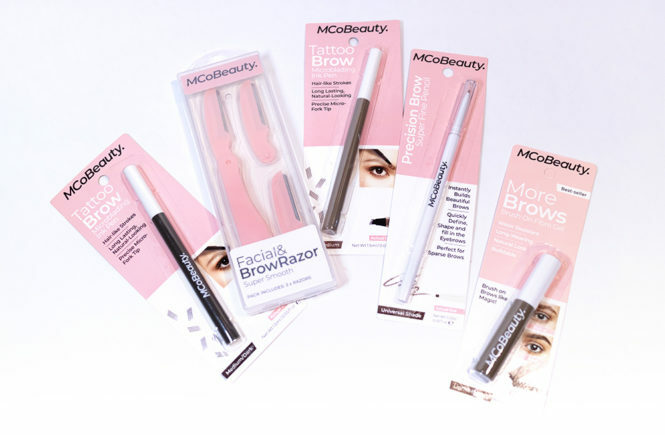 Let me know down below which products you’re wanting to pick up or, if you’re lucky and have already tried out this collection, what are your favourites?